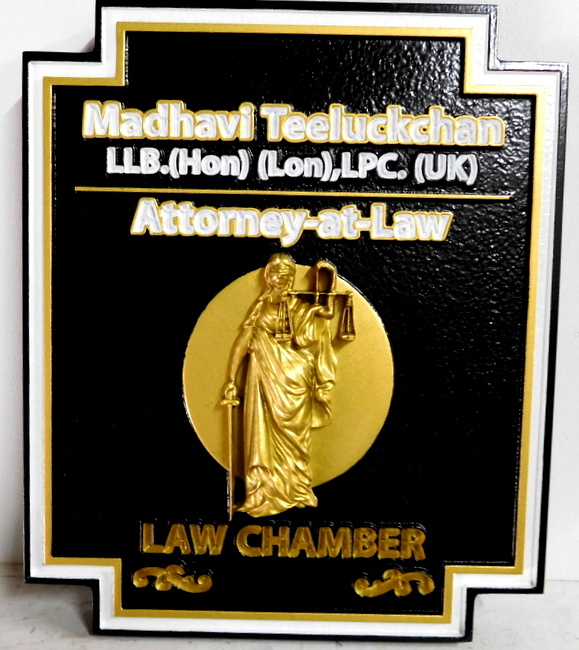 Above is a photo of an attorney's sign which has gold-leaf gilded carved 3D artwork ("Lady Justice") and gold-painted text.. The gold text on the black acrylic plaques is painted. Gold look elegant with black and white colors. This wall plaque is 30 inches high. Please click on Product Gallery 7 to see 100 other bronze, brass, copper, gold, silver, nickel-silver (German silver), stainless steel and aluminum plaques and signs. To see other photo galleries, please click on one of the numbered gray boxes in the lower left margin of this page to see other photo Galleries. Other Attorney signs are shown in Gallery 10. To see prices or get Estimate and Order forms , click on gray boxes in upper left margin. Click on dark gray tabs on the header to see Home and other informational pages.